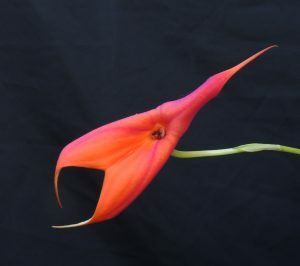 The third species for ‘orange week’ is Masdevallia veitchiana. Regulars to 365days will be aware that this species flowers intermittently throughout the year and that the individual flowers last for a couple of months making this one of our most reliable masdevallias. This species is endemic to Peru where it grows between 2000m and 4000m as a terrestrial on rocky slopes amongst grasses. This explains the long flower spikes which carry the flowers well clear of the leaves and in reach of pollinating humming birds. What a magnificent orchid. I love the striking orange colour. What does the word Wajanki Mean? Unfortunately Google translate doesn’t include the Quechua language. I think this Masdevallia orchid and Masdevallia coccinea have to be my favorites of all the Masdevallias that you have in your collection. They are so simple, almost minimalist and have such vibrant colours. Absolutely lovely.